There’s something about sax, soul and sass powered group, Amy Lynn and the Gunshow, that makes one believe they have already long discounted and dismissed the fears many groups develop when prepping a sophomore album –also known as the dreaded “sophomore slump.” Yet, one would be pleasantly surprised to find the Gunshow actually only at their “Freshman first,” so to speak. Dropping a week from now, “Don’t Trip on the Glitter” is the title of the Gunshow’s debut LP and the band could not be more ready to explode onto the scene. 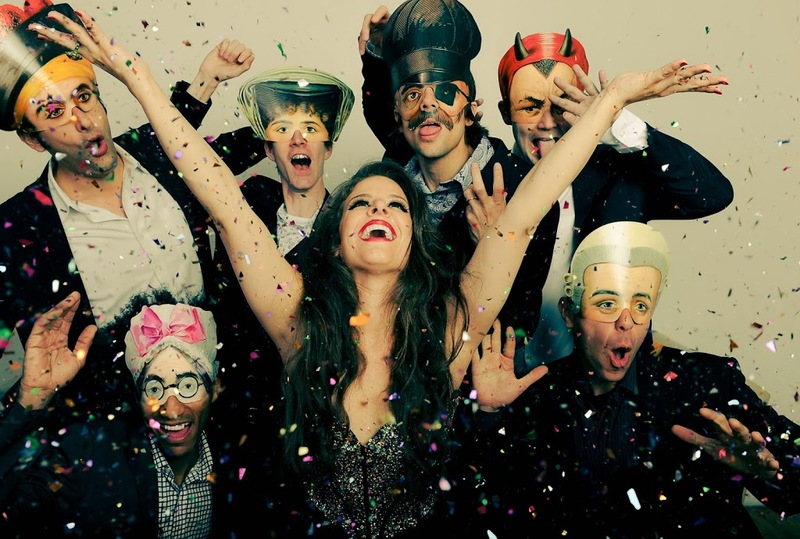 Despite “Glitter” only being the Gunshow’s first record, my impression of the group standing ahead of the typical curve has to do with how it has managed to, by applying just the right amount of change, sagaciously evolve from the already appealing form they presented with their last EP, “Clearly” –the work that first introduced me to the Gunshow. back in August 2012. 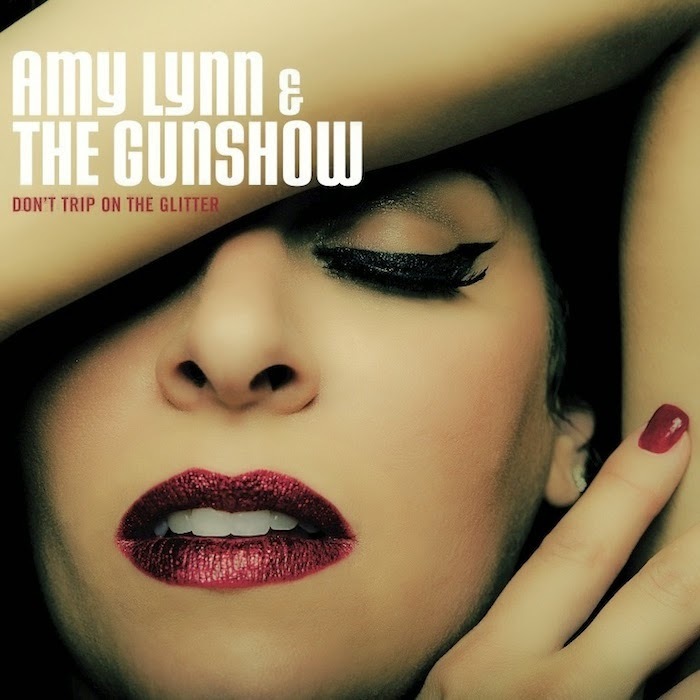 The Gunshow’s instrumental finesse, combined with Amy Lynn’s audacious vocal fortitude back then, made it undeniable that they were only going to improve, given plenty of time and space to create; a comfortably made foresight now seen coming to light with the release of two enticing singles (“Remember (Walking In The Sand)” and “Don’t Trip on the Glitter”) and a major cable worthy-music video for the titular track (See below). Amy Lynn Hamlin: There’s definitely a huge difference…you know, we finally settled with a certain group of [musicians] too, so I think that has [something] to do with it. We changed our drummer, we got a solid horn section and, we’ve done, just a lot of rehearsal and a lot of planning, that went into the album before we even thought about recording yet. So it’s like, “You know what? We have to get the best nine songs.” And, um, [we] took a lot of care, prior to even finding a producer or a recording studio. So I think that’s what made the difference. And then, once we did find the producer, Steve Greenwell, he was on the same page as us and we took an extremely long time with him too. …[Working with Steve] was an unbelievable experience. It was really educational and I think it really allowed everyone to just grow as musicians. [We were able] to just feel truly liberated in the studio, knowing that you have someone that has your back. …Everyone felt prepared and confident. We trusted Steve’s ears behind the glass because when you don’t have anyone else there, you have to do almost two different jobs, rather than just focusing on what you’re doing [with the music] and the album. …You know, Steven said before we had even gotten to the studio, that if we put care and we put love into the project from every angle: the songwriting, the engineering, the producing, [with] every band member really focusing on what they want to bring [to the process,] then it’ll all come together and you can’t help but get the desired product you want and I think that that’s exactly what happened. I think it [all] really shined through. Kira: A sax and horn based group is always going to have that as the recognizable base characteristic, and thus, a component that stays the same. Yet there never comes a moment where it sounds like “I’ve heard this lick or riff multiple times before,” or “This is getting sonically predictable.” Did you draw on any new jazz / blues inspirational sources when you started working on material for this record, and, how did this branching out influence things like song arrangement? I notice there are both new instruments/sounds in the mix, as well as familiar parts like strings, (in the somber ballad, “Cloud of Smoke” for example,) that are pushed more to the forefront, while pulling simultaneously pulling back on the sax, even though the instrument can hold its own for both the musically happy and the sad. Was this another method you chose to change things up? Kira: What was it like to do the recording sessions in one marathon, multi-day go round? Can you walk the non-music business crowd through what it’s like to record your nine piece band? Any crazy escapades or spontaneous moments of recording genius? Furthermore, how did this recording experience compare with your process for your previous releases? …It was basically an awesome experience. We would record all day, from maybe, 11-7 with a break for lunch and…we would have…family-style dinner[s] and…we would possibly go back in the evening[s] for maybe like, some more…like the B3 Hammond, or, something extra. But you know, essentially all the takes you hear [on the finished album] were just straight through. There wasn’t really any punching in [of different parts]. It was just…that’s why we love it so much too –because I think it really captured our live performance and they energy that we have because we were all in the same room. [We might have been] in different compartments but we could all see one another and we would perform maybe, the songs a few times and [then,] we’d just go and listen as a band and as a whole, with the producer. We would decide, which [take] you know, had the best groove…It was just one of those experiences I’ll never forget. [Steve Greenwell] really helped us do everything and everyone came out of there, better musicians. Kira: I love how the opening track, “Remember (Walking in the Sand)” sounds both modern and old fashioned at once. It’s as if you took a more classically arranged soul song and did a 2014 remaster. That paradoxical quality seems to stick around and flow into the second track, third and, well, stay strewn throughout the whole record. Are you thinking of keeping up emphasis on this style going forward, kind of like a new musical signature for the group? Amy Lynn: It’s interesting that you say that because I’ve always thought that same thing as well –that definitely the tone of this album, it has a throwback vibe but still is trying to keep modern…I don’t really think we, I mean, I know we don’t fall in like, the Sharon Jones, Amy Winehouse vein [exactly] but, we still have that sort of taste and so I think that it’s definitely a deliberate move on our part. …We want to keep current but we still are paying tribute to everything that inspires us. Just like, Otis Redding, and you know, the Motown sound. It was definitely something we were considering and I’m glad it actually shined through. Kira: Speaking of style, I know that you had been bouncing around ideas for what is now the band’s literal, new look. How did you come to the end consensus visible in your new photos? Amy Lynn: That took a lot of hinedearching and just, kind of thinking about what we wanted to look like and how [we wanted] to come across –especially on the web. I think the pictures that we finally have now are a good representation because of the filter, and, just, I think it goes well. I think it matches with the music. [Like you were saying before] it’s old school but it has that modern sheen. It was a process because I was just [thinking], “I don’t want [the band] always to just be in suits and ties but it’s like, “Why can’t they be?” either?” So I feel like, it’s not really about what they wear, [so much as] it’s going to be about how the pictures are delivered. And so, I think there’s a lot of silliness in our pictures but there’s [also] the serious side. So I think we’re just going to be continuing to experiment with what we’re wearing and what works best because I’m still not 100% on all that but I do know that it’s just, looking better, in terms of, “the look,” right now, you know what I mean? It’s still a work in progress. Amy Lynn: We decided on [doing the video for] this song, just because, it’s the name of the album and it’s…I think, a good representation of me [individually] too, because I get serious but then I’m silly too, so, I thought that it would be a good one to start with. We work[ed] with the same guys from our first [project,] the “Clearly” music video. …They come up with many of the ideas and we give them input on whether we like it or not. [From there,] we all just tried to figure out what choreography we could do and…even the way Jackson Pollock used to throw his paint was [part of] the way I was choreographed by [our choreographer] Dylan [Pearce].” Everything you see in the video, I mean, almost, 85% was choreographed; except for…some parts at the end where I’m like, just being silly and kind of messing around. That was more of an improv. What [the set designers] did, was, they took an old barn, that was in the family of one of the crew guys and they took [everything] out. They made the set with four white walls, put it all together –it took them a day– and then, by the end [of shooting], it looked, like an art museum. There was paint everywhere, every shot was crazy because sometimes I would have paint all over me and we would have to do it again, so people would come over and just like, wipe, with baby wipes –I’ve never seen that many baby wipes in my entire life– all the paint off of me. I would have it everywhere –in my hair, on my legs…my toes. And so we would just wipe it all up, do the take again…At one point there was so much paint on the ground that we had to clean off the cement floor and you know, try and get it to be dry, which then [led] to me spraining my ankle that day. Then add the glitter to it and then it was like…I was finding glitter everywhere Kira. I’d say it was one of the most exhausting days of my life but also one of the best. …Seeing everything come to fruition was really cool too because it was really nothing like I had imagined…I was delightfully surprised. Kira: Since it is one of the lead singles for your record, and the tile track, mind disclosing the story behind “Don’t Trip on the Glitter?” It definitely has a self-empowering, kiss off theme. Why glitter though? Any hidden metaphors/symbolism with that? Amy Lynn: For me, it was more that, to me, glitter represents success and, in this specific statement [of the song,] it’s like, “Don’t trip on my success as you walk out the door.” I thought that glitter was a wonderful way and just a descriptive and awesome visual for people and, I love glitter. It makes me happy wearing it, makes me happy putting it on my eyes, and, it [represents] like, all the good things in this song. It’s just as simple as that. Kira: So, you have the album release show with the fantastic Shayna Steele, coming up at Joe’s Pub on May 8th. After that, what’s next for the Gunshow? Amy Lynn: [Literally speaking,] we have a string of dates, we’re going to Boston and Connecticut. Even actually, before the May 8th [album release] show, we have a festival coming up [this] week in Connecticut. …June, July, August and September we continue with these Northeast tours and then [also] in September, we’re planning on, for the first time, going down south, which will be really cool too. “Glitter” is an all-around advancement for the Gunshow; akin to that surprise time when a somewhat recognized kid in the hallways of school, gets a makeover and suddenly everyone has to stop, if for at least a moment, to process how good they look and how well they carry themselves afterward. Furthermore, at best result, the title of the Gunshow’s debut LP will be looked at, in retrospect post-launch, as having conceived a “successful bit” of its own clever foreshadowing. “Don’t Trip on the Glitter” drops April 29. You can pre-order the album from Bandcamp now and immediately receive the title track as a download! Tickets for the release show at New York City’s Joe’s Pub, are on sale now! 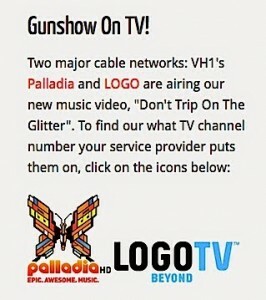 Check out the fruits of the Gunshow’s sparkling labor and “Don’t Trip on the Glitter,” below!